This beautiful hand-crafted gourd box representing the beast of the Nile is made by artisans at Tito Medina's workshop in Huancayo, Peru. 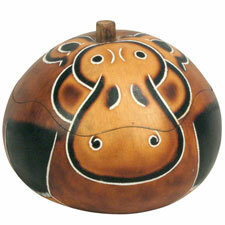 Gourd carving is a traditional craft of the Andean mountain region and in the Medina family it spans four generations. The art of carving gourds is helping to bring sustainable income to more than 20 artisans and their families. Use this unique gourd box to store your trinkets, keys, coins, etc. Measures approximately 3� high x 3-1/2� diameter. Handmade, etched, and carved�in Peru and fair trade imported.